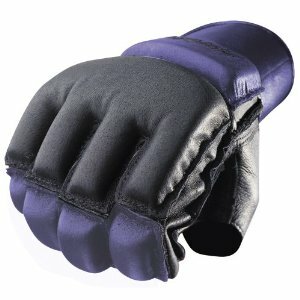 The Harbinger 322 Women's WristWrap Bag Glove is great for kick-boxing, martial arts and bag work. When I walked out of my first Krav Maga self-defense class with knuckles scraped raw and forearms aching, I knew I was going to need to buy a good pair of bag gloves. After careful research, I decided on the Harbinger 322 Women’s WristWrap® Bag Glove. At $50.00, they cost more than similar gloves of different brands, but the noticeably higher customer rating convinced me to give them a try regardless. As my knuckles can now attest, it was a worthwhile investment. The Harbinger 322 Women’s WristWrap® Bag Glove is designed for women who want to practice cardio kick-boxing, martial arts, and bag work. For this range of exercises, the glove needs to be small and light enough to allow for dexterity, but also heavy enough to absorb some of the impact when your fist hits the bag. The Harbinger 322 glove is a good compromise between these demands. I found them to fit snugly and comfortably, and they didn’t chafe after thirty minutes of bag work. The wrap design provided a lot of stability for my wrist, so I felt safe hitting the bag with full force. They were light—not cumbersome at all, and easy to quickly remove for grappling practice. The one major complaint I had was the grip bar in the palm, which was distracting and made it impossible for me to close my fist all the way. I ended up doing my own modification by cutting a small hole and removing the bar. Also, I can see how the padding might not be adequate if the bulk of your workout is heavy bag work—in that case, you should order a size up to allow room for extra wraps inside the gloves. 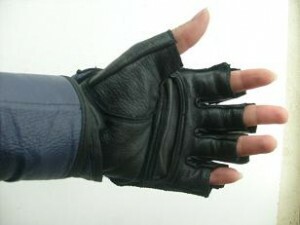 I removed the grip bar from my Harbinger 322 Women's WristWrap Bag Gloves so that I could close my fist fully. The Harbinger 322 Women’s WristWrap® Bag Glove comes in only one color, Indigo/Black, and is available in sizes S, M, or L.
If you don’t want to spend $50.00 on a pair of gloves, especially if you’re new to martial arts or kick-boxing and not sure yet if you’ll be needing to get years of heavy use out of them, there are plenty of other women’s kick-boxing gloves available to try. For example: the Century Women’s Leather Wrap Glove, or the Everlast Women’s Wristwrap Kickboxing Glove. If you need a heavier boxing glove, try a bulkier variety like the Everlast Women’s Pro Style Training Glove. For my knuckles’ sake, I wanted to make the right choice the first time, and I’m glad I did. If you are committed to your cardio kick-boxing, martial arts, or bag work practice, and need a glove that will keep your fists flying happy for a long time, then the Harbinger 322 Women’s WristWrap® Bag Glove is a worthwhile investment. These gloves are the best!! When I started cko kickboxing the gloves they gave me resembled really cheap boxing gloves and my hands slid around in them too much, when I upgraded to the harbingers it was a totally different workout and I had so much more control in my punches. It took a week to wear them in, so I do recommend hand wraps otherwise you’ll have raw knuckles by the end of your first week like I did. I still get raw knuckles, but I think that’s because I got to 4-5 classes a week…that’s a lot in general for women’s knuckles to take. Bottom line these harbingers are a Must Have for kickboxing.